Marvel: Ultimate Alliance 2 has unveiled the first of what we hope is a series of downloadable characters to expand their already extensive roster. Sorry, everyone, it's not the Juggernaut. 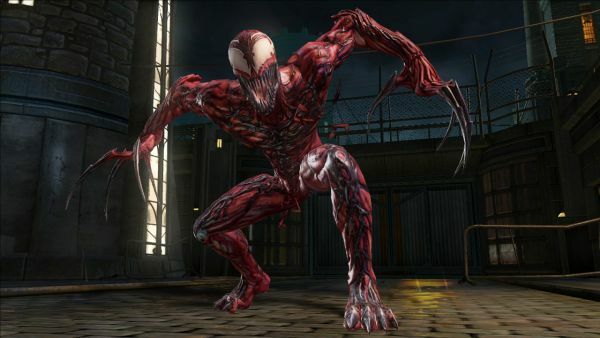 Carnage is the first Marvel personality to make the new list of characters to be released via DLC pack. Buckle your seat belts, it's dinner time! Carnage, one of my personal favorites from the Spider-man symbiote storyline, leads the pack with his creepy-crawly move set. He'll charge around on all fours, unleash long-distance fury attacks, and he even sounds creepy with his echoing symbiote voice. It should be noted that Carnage is not his over-sized self, as depicted in later Spider-man storylines. Instead, he's his creepy, wiry, murderer "Cletus Kassidy" self once again. Since we're all about co-op, we wanted to know how Carnage's cooperative Fusion attacks worked with other characters. While the test-run with Wolverine was disappointing to IGN, The Thing had a much more explosive result. "[I] teamed him with the Thing, and was blown away. Here in a targeted attack, Thing throws Carnage up into the air so that he's off screen before the creature hurtles back to Earth headfirst and eats the intended target (assuming he's a grunt). Carnage just gulps him up and slams into the ground causing all of these cracks in the pavement. Best of all, after the guy was gone, Carnage says "Your spine: it's what's for dinner."" Sounds appetizing. Who else do you hope to see in this Marvel: Ultimate Alliance 2 DLC Character pack in the near future? Our vote is for The Juggernaut, what's yours?